May satisfy if your expectations are kept to a minimum. The first Sherlock Holmes was fun, exciting, and unique. It far exceeded my expectations. A Game of Shadows doesn't have the charm of the original film and left me disappointed. A Game of Shadows starts off with a bombing in Germany that we come to realize is much more sinister than it appears. In connection with this bombing, Sherlock Holmes (Robert Downey Jr.) follows his feisty love interest Irene Adler (Rachel McAdams), which leads to the first big fight scene showcasing the unique direction of Guy Ritchie. Holmes prevails and is able to catch up with Irene just as a she delivers another bomb to an unsuspecting recipient in return for a note to be delivered to the unknown mastermind behind the exchange. Holmes manages to take the note and successfully detonates the bomb without any injuries. However, Adler escapes and Holmes finds the bomb recipient dead from a poison dart. We then discover that Adler has been working for Professor Moriarty (Jared Harris) whom upon learning that Holmes got away with the note disposes of Adler. Dr. John Watson (Jude Law) visits Holmes and learns of his obsession with Moriarty. Holmes is able to talk Watson into assisting him one last time to thwart the criminal's master plan. Before starting off on their adventure, Watson believes that Holmes has planned a bachelor party in connection with his upcoming nuptials only to learn that it is really Holmes' following his first lead. At the club, Holmes meets Madame Simza Heron (Noomi Rapace), a gypsy fortune teller who is the intended recipient of the stolen note. The note is from her brother in regards to an anarchist movement that they have both been involved in. Holmes foils an attempt on her life but she flees in the process. Watson and Holmes catch up with her, and the adventure begins as they travel Europe to unravel Moriarty's scheme. Robert Downey Jr. sparkles as the quirky Holmes but at times is over the top and ridiculous. The chemistry between Holmes and Moriarty is the best part of the film. I adore Jared Harris and think he is a fantastic actor. My appreciation started with “Fringe” and “Mad Men,” but here he perfectly plays the criminal genius who is a veritable match for Holmes. The final scene between the two is perfection, but it is unfortunate that Ritchie didn't use this more to his advantage. The 1080p/MPEG-4 AVC encoded transfer is very impressive. The color palette is heavy on blacks, grays, and dull colors, all of which are well rendered. Blacks are particularly rich and deep. Shadow delineation is exquisite as all that Ritchie wants revealed in the shadows is able to be seen. There are extremely fine details on display, from facial stubble to ornately designed rooms. The DTS-HD Master Audio 5.1 track is powerful, too much at times even, as the occassional distortion makes clear. The first explosion demostrates the wide dynamic range by not only the rattling of the entire system, but also exhibiting the faint sounds of tiny bits of falling debris in its aftermath. Every punch sounds bone rattling and blades slice through the air. Dialogue is clear and the music doesn't get lost in the mix. The special feature “Maximum Movie Mode: Inside the Mind of Sherlock Homes” offers a unique commentary by Robert Downey Jr. where he is split-screen when providing background on a scene. There are also interviews, still galleries, storyboards, and behind-the-scenes looks. I don't see anyone watching the entire film this way as you can't really watch what is taking place in the film during these moments. A making-of featurette would have been more successful. “Focus Points” is an in-depth behind the scenes look at film ranging from the critical action sequences of the film to the main characters and plot points. The negatives of A Game of Shadows outweigh the positives so I can't wholeheartedly endorse it. Seeing how Holmes processes clues and deduces the outcome of a chain of events is fun to watch, and the film's resolution is well done, but it isn't enough to make up for so much of what doesn't work. It is too long and the mystery is rather convoluted. If you highly enjoyed the first film, this one may satisfy as well as long your expectations are kept to a minimum. 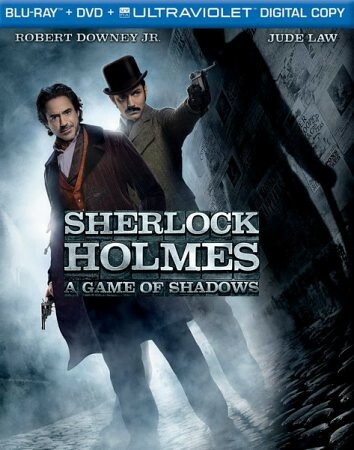 Sherlock Holmes: A Game of Shadows - Own it on Blu-ray Combo Pack or Digital Download 6.12.12. Be sure to check out the free Sherlock Holmes: A Game of Shadows movie app for iPad2 or Kindle Fire. The app synchs with the Blu-ray disc to start exploring the rich and exciting history of Sherlock Holmes.